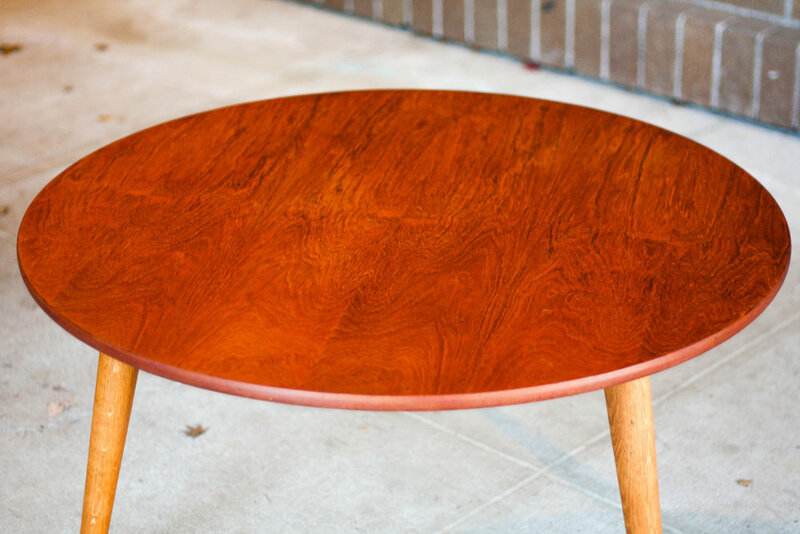 Hans Wegner's philosophy of never designing furniture with a backside is clearly visible in the construction of his round AT-8 Coffee Table. Designed by Wegner in 1954 for Andreas Tuck. The table features stunning teak grain throughout the table top and edge with various shades or red, orange, and brown highlighted. Solid wood tapered legs join to an oak apron attached underneath. The legs can be unscrewed in a jiff to accommodate safe/easy transporting. This table is usually seen in oak wood and produced by Carl Hansen and Son, but this teak version is a first edition and produced for Andreas Tuck. A true collectors piece.